The winner of the 2018 prize was announced at the opening night of the Queensland Poetry Festival. 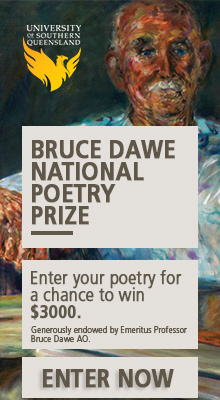 The prize is open to Aboriginal poets, emerging and established, throughout Australia. The prize for a single poem (or suite of poems) of 80 lines or under is $2,000, plus a series of mentoring sessions with an established Indigenous poet. The highest-placed Quandamooka entry receives $500 plus a membership to Queensland Writers Centre. The imagery, symbolism, and language are powerful and underplayed in a poem that highlights the importance of intergenerational transference of knowledge and tradition.